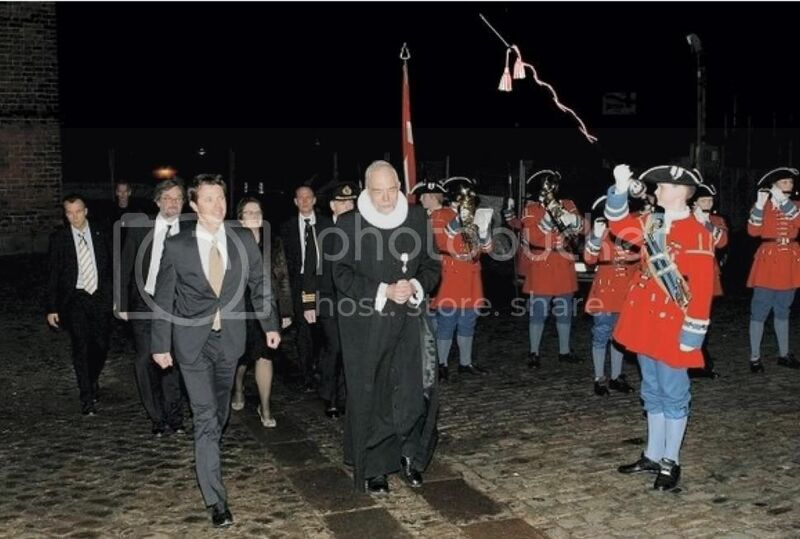 Last Tuesday (26 February 2008) Crown Prince Frederik attended a ceremony to mark the 350th anniversary of the Roskilde Peace Treaty in Roskilde Cathedral and later at an exhibition at the Roskilde Museum. 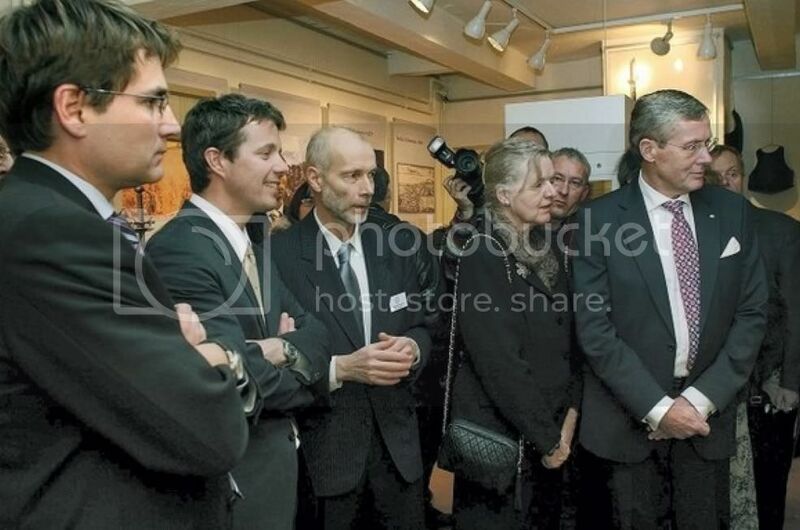 There was a memorial service in Roskilde Cathedral which was solemn and afterwards Frederik visited the exhibition along with other guests at Roskilde Museum. Danish and Swedish documents are exhibited and representatives from both Denmark and Sweden were present. 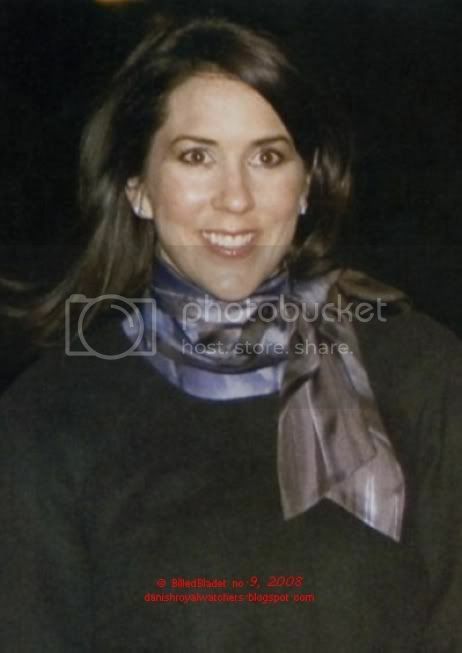 Crown Princess Mary took part in the annual Copenhagen Business School Case Competition Dinner for 2008 on February 25 in the evening at the Carlsberg Museum in Valby, Copenhagen. The Case Competition is a student organised business problem solving challenge which is sponsored by the Copenhagen Business School. The Case Competition sets students with a real problem solving task based on a real company in the spirit of building skills and co-operation with other participating international student participants and business schools worldwide. It is intended to build innovative resolutions and networking with international participating students and faculties. The dinner comes at the beginning of a week of challenges among students in an intense programme. There are 12 teams from nine countries which compete in Copenhagen to solve a nominated case based on a real company. Each team has four top students and a faculty advisor from their school. 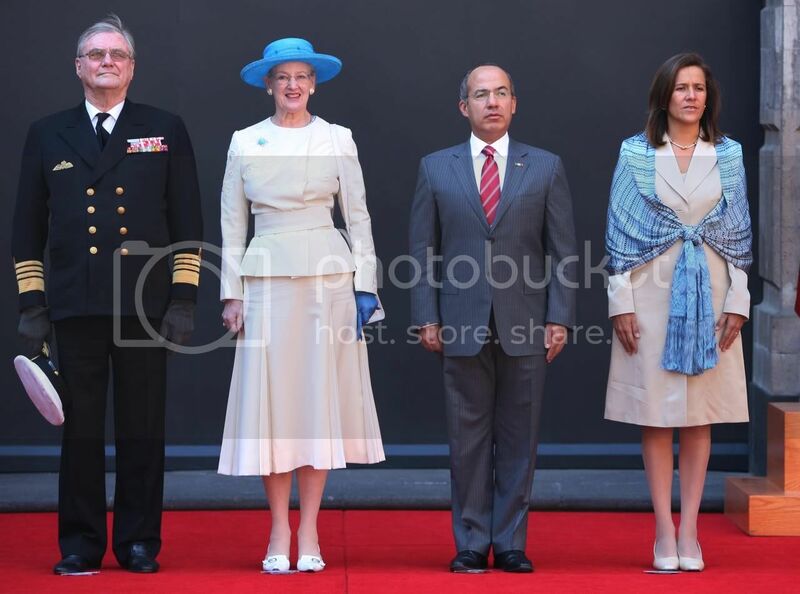 A catch up on Queen Margrethe's and Prince Henrik's state visit to México from Billed Bladet. 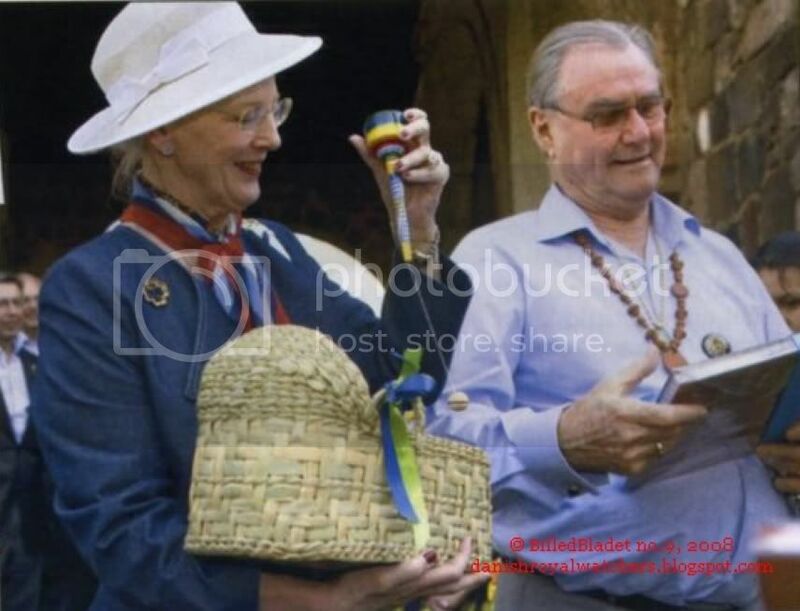 The Queen and Prince Henrik completed the official part of their trip and then had a few days for a private visit to Mayan and Aztec sites. Billed Bladet 1, Billed Bladet 2 and Billed Bladet 3. 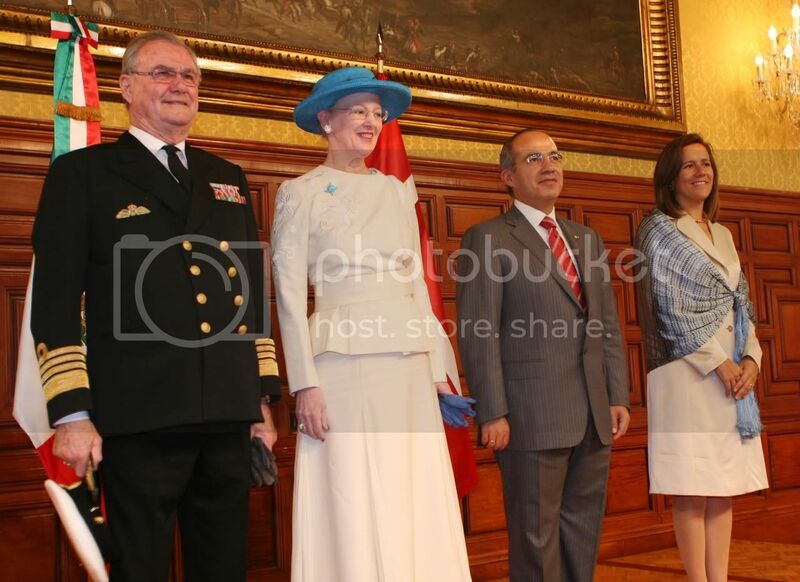 Queen Margrethe displayed genuine and great enthusiasm when on the last day of the official state visit to Mexico she had to summarize what had been the most exciting thing during five hectic days. There has been many impressions, fantastic and colourful, but flying north from Mexico City to arrive at the small village Tarecuato, where the distant relative of the Queen, Friar Jacob, once lived, was a particularly enchanting experience. Friar Jacob was a Franciscan monk and founded a monastery in the 1500’s. “I got a sense of friar Jacob’s spirit still being present in the village and the monastery. It was beautiful and heartrending,” said Queen Margrethe, who flew by helicopter in order to get so far out into the countryside. Friar Jacob was son of King Hans and as such brother of Christian II. He arrived in Mexico in 1553 as the first Dane and fought for Indians to be considered equal. That wasn’t always popular. “He may have been a bit revolutionary,” interjects Prince Henrik who followed the press meeting with a big relaxed smile, while he rested himself on his new walking stick. Q: Can you keep up the high level of activity? 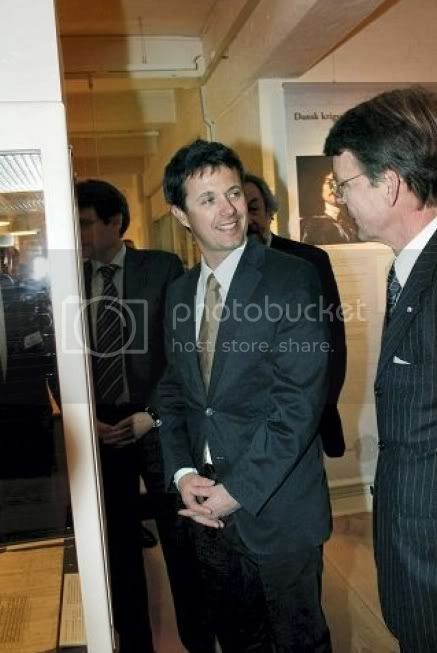 While the Regent Couple has been in Mexico, the debate as to whether Crown Prince Frederik ought to run for membership of the IOC has continued here at home. 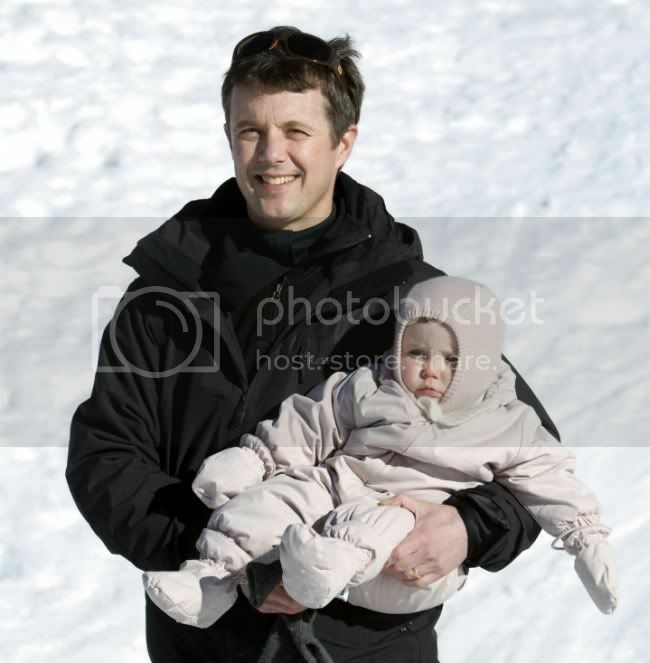 Q: What is your attitude in respect to Crown Prince Frederik wanting to join the IOC? Queen Margrethe and Prince Henrik have both been to Mexico before, but separately. Q: How is it to be here together? Q: Mexico City is an overwhelming city of 27 million inhabitants. How have you experienced the city? Q: Have you had time to buy something for your grandchildren? Perhaps there was a small present for the four grandchildren. 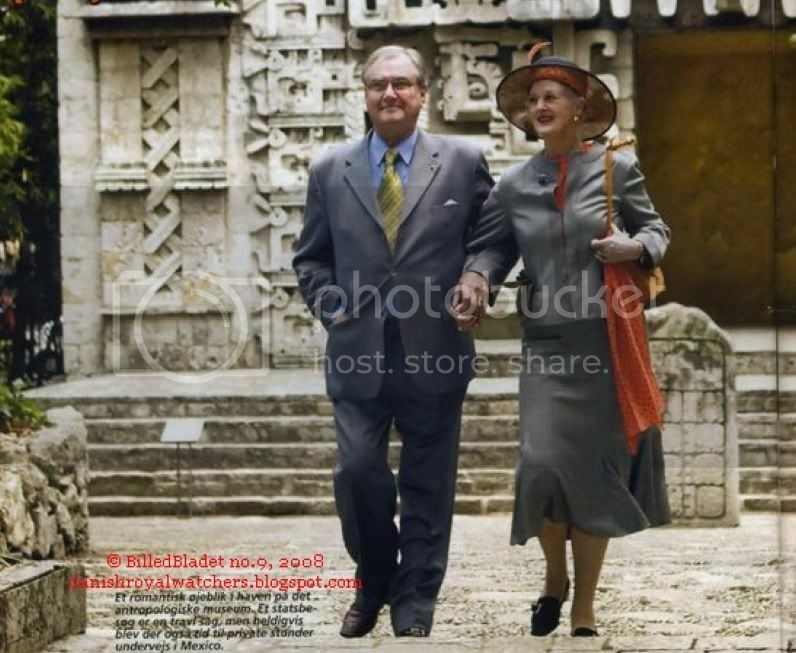 Queen Margrethe and Prince Henrik stayed for additional three days in Mexico in order to relax and look at the exciting ruins in the south at Chiapas. 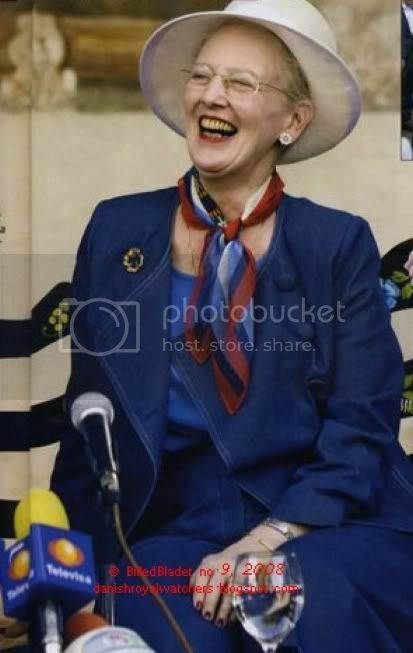 From there Prince Henrik travelled to Nicaragua and Queen Margrethe flew home to Denmark in order to on to a skiing holiday in Norway. (by Annelise Weimann and kindly translated by Muhler). Billed Bladet (no. 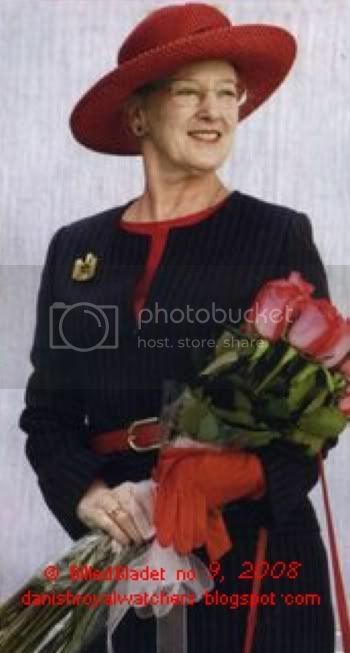 9, 28 February 2008) 'Margrethe fik blomster af gadebørnene' – Margrethe was presented flowers by the street kids. “Will the Queen be wearing a long dress? Will she be wearing a tiara?” Fifteen-year-old Paula is almost bursting with curiosity. In a few minutes she will meet Queen Margrethe, who, along with Prince Henrik, is on official visit to Mexico, and for Paula this is about the greatest and best thing that has happened in her life. Paula lives in an orphanage, Casa Sonrisa, in the middle of Mexico City. Her mother abandoned her and her sister Maria to the streets because she couldn’t cope with taking care of them, and the girls have by good luck ended up in the little home. They have been allowed to stay in the same room so they can support each other, and they are having a cosy (hygger) time with their teddy bears and dolls and they play with the ten other girls in the home. Paula and Marie are two lively children but they are not keen on talking about their rough background. Casa Sonrisa is for children who have been abused or sexually molested and they can’t manage to talk about that yet. "We really like to be here and we are starting at school soon,” they say with enthusiasm. Paula cannot read yet, but her fourteen-year-old younger sister can read a little. The visit to the orphanage is an important item during the state visit, where the Regent Couple visited as many businesses and institutions with a relationship to Denmark as was possible. Casa Sonrisa was built from the money that was raised from the sale of the Children’s Third-World Calendar (*) in Denmark. So much money was raised that three small orphanages could be furnished as well as a clinic for children with terminal diseases. The orphanage is a success story which shows how much Danish funds can help in a poor country. As such, the orphanage was one of the places Queen Margrethe absolutely wanted to see when she was on an official visit to Mexico last week. The Queen didn’t just see the beautiful and colourful Mexico but she also got an impression of the problems the country has. 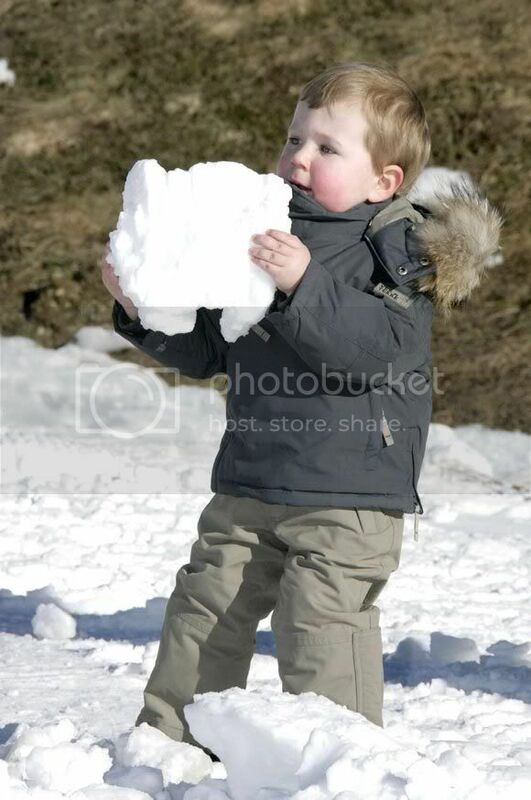 And the children on the streets are one of these. Even though Paula and Maria have had a sad fate, they are also fortunate. They no longer live on the streets but in a house where caring adults look after them. They are fed and clothed, get to see a doctor when they are sick and they also get to go to school. Not all children are so fortunate in Mexico City. Nearly 40,000 children live on the streets, and that can either mean the parks, down the sewers or under the bridges. Casa Sonrisa is a small orphanage and the twelve girls live in bunks in three rooms. In honour of the visit of the Queen everything has been newly painted in the Mexican style of neon green, pink and turquoise all mixed in, so it’s a colourful spectacle that welcomes the royal visitor. 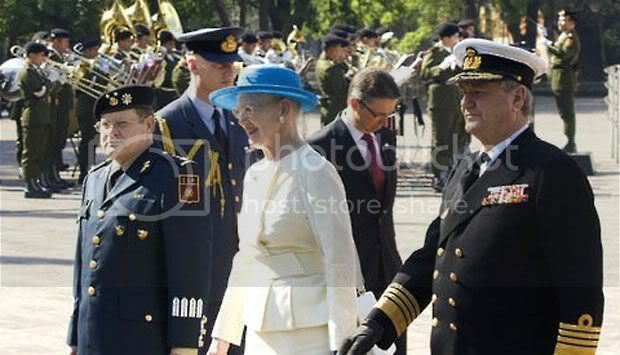 Even though she cannot talk with the children, there is a fine rapport between the Queen and the girls. As time goes on, most forget their awe and approach to touch the fine lady. That makes the Queen smile a big smile. She is however not dressed in the ball-gown the children had hoped for and she is not wearing a tiara either, but her blue suit and the red hat is after all much grander than what the children can ever hope to get. * Børnenes U-landscalender. It’s sold every year up to Christmas. The surplus is donated to various projects in the third world. 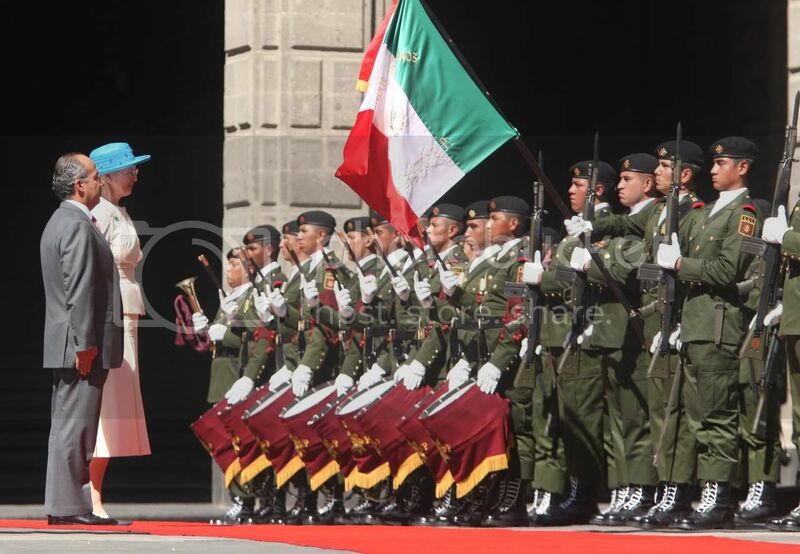 It was obvious that both Queen Margrethe and Prince Henrik enjoyed the five-day state visit to Mexico last week. The trip has been planned twice, but has been cancelled at the last minute. Finally it had come and even though the visit, which is the first done by a Danish regent to the beautiful state, was hectic and busy, the Regent Couple had some opportunity to relax together. In the garden at the anthropological museum the Queen and Prince Henrik took time for a little stroll hand in hand, during which they could chat in confidence. The visit to what is considered one of the best museums in the world was such a great joy for both of them. Here they saw some of the most lavish objects found in the Mayan cities and a large number of fantastic sculptures. They also saw the huge Aztec calendar stone that foretold that the Earth might face doom at a certain date, if the gods were not placated. They were [also able to see exhibits about] human sacrifice. Then the Regent Couple saw some of the stones which were used for the human sacrifices. The ancient Mexican culture interests both the Queen and Prince Henrik so much that after the state visit they went for a three day holiday in order to see a number of the most impressive temples and ruins of the past in Mexico. 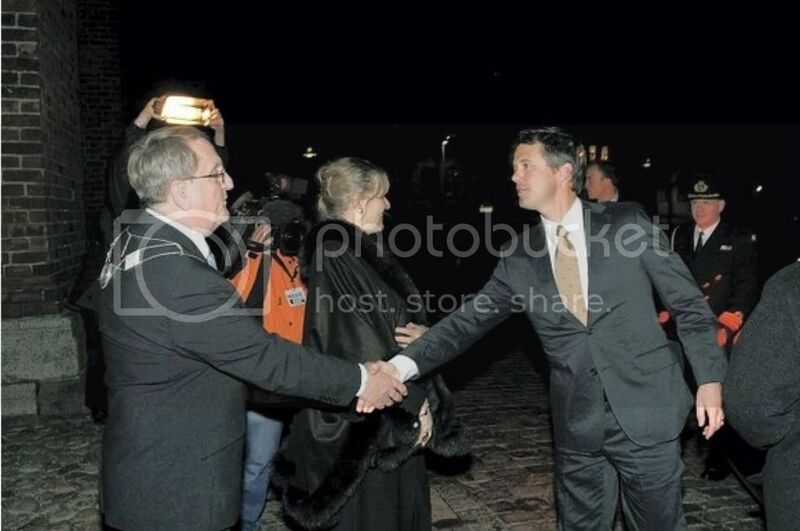 A state visit is not just pleasure but also an extremely busy journey and in order for so many as possible to have a Danish royal visit, the Queen and Prince Henrik were often out separately. At the exciting Franz Mayer Museum, the Queen saw an exhibition of modern Danish jewel art and many of the jewels were large and fantastic. Q: Would you yourself like to wear some of the jewels? It was also an eager Queen who saw Danish contemporary art at the San Carlos Museum. Seven Danish artists have taken part and the Queen really took her time to look at it all. She asked lots [of questionsa] and it was obvious that it was a professional who knew what it was all about. In particular Helle Mardahl had a long chat with the Queen about the large sculpture with the jutting breasts, which she calls Self-portrait. This fascinated the Queen a lot and so did the paintings. “I think it’s age that is starting to set in.” Prince Henrik smiles broadly. He doesn’t need to hide the fact that he turns 75 in June next year and when halfway through the official state visit to Mexico last week he suddenly started using a walking stick, the explanation was obvious – his age. “However not with a walking stick,” adds Queen Margrethe laughingly. 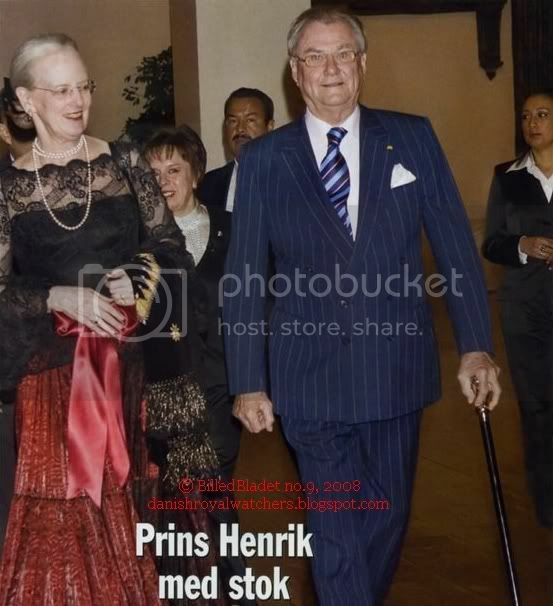 Q: Are you also using a walking stick at home, Prince Henrik? 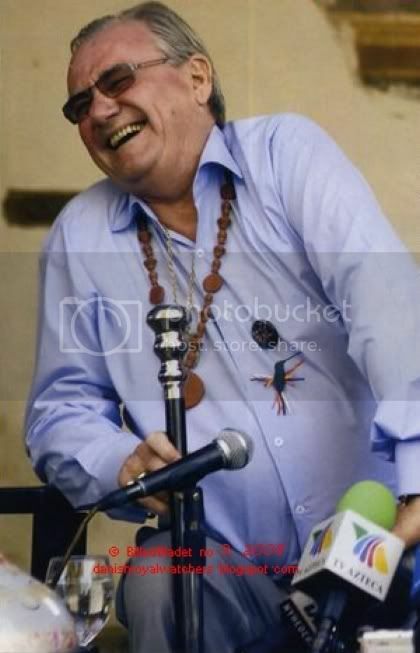 During the visit to Mexico, Prince Henrik was often dressed in summer clothes and it didn’t look at any time as if he had lost weight. Q: You have just been on a slimming-down trip to Italy. Have you had problems sticking to the diet afterwards? Q: How much weight did you lose while on your diet? Q: Have you gained the kilos again? Crown Princess Mary met with Marie and Mads at Amalienborg as part of the making of a TV documentary by TV2 made for Rare Disorders Denmark and the promotion of a new special day in the calendar. 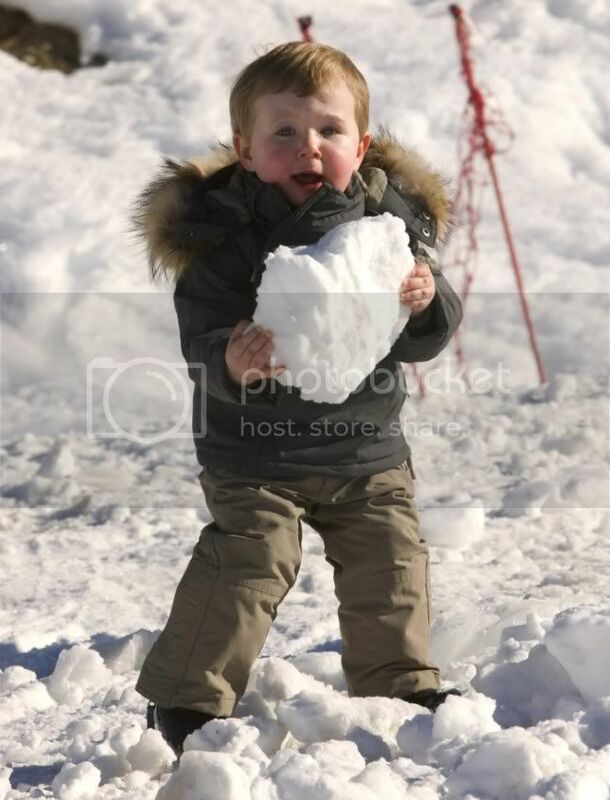 The photos were taken on 14 January 2008 by Steen Brogaard during the making of TV2's short documentary describing the daily life of children with rare diseases and the children's meeting with Crown Princess Mary. Crown Princess Mary is the patron for Rare Disorders Denmark and met Marie the last time she attended an event for the organisation. The president of Rare Disorders Denmark Torben Grønnebæk and the director Lene Jensen were the two who represented the organisation at Crown Princess Mary's New Year reception for her patronages on January 10 at Amalienborg. The Rare Disorders Day in Denmark will be marked by a conference for professionals and patients' representatives, a 'rare march for very special people' to go from the conference centre to the city square at Copenhagen's Town Hall where there will be an advocacy event followed by an award to a person or an organisation for a significant contribution to support improvements dealing with rare disorders. The European Union is currently evaluating EU health policies in relation to rare disorders and is a part of a more concerted world wide effort to address the problems of management and research into these disorders as a matter of public health. This new Rare Disorders Day is a European Union initiative. Rare disorders are genetic diseases but can also be from environmental exposures during pregnancy or later in life, often in combination with genetic susceptibility. They can be very different in severity and symptoms and sufferers usually have a reduced life expectancy. Many of the disorders are complex, degenerative and chronically debilitating, however, some others may allow a normal life if they are diagnosed in good time and then managed and treated correctly. Rare disorders can affect physical capabilities, mental abilities, behaviour and sensory capacities and also produce disabilities. The disabilities can be isolating, a source of discrimination and limit life opportunities, partly because there is a lack of understanding about disorders which many people do not understand and may feel fearful about. Twelve-year-old Mads and 11-year-old Marie both suffer from a serious rare disorder as well as the pleasures and sorrows of everyday life which they experience together with their families. But they live a good life, in defiance of all the challenges their conditions give them. In a programme to be shown on the evening of February 26th, TV2 meets Mads and Marie and Crown Prinsess Mary, and while each of them are certainly rare in their own way, it is also another kind of rarity, because there aren't many crown princesses in the world. Crown Princess Mary is the patron for the organisation Sjældne Diagnoser [Rare Disorders], which advocates the case for patients with rare conditions. Sjældne Diagnoser is an umbrella organisation for a number of small patient organisations for more than 30,000 people with rare diseases who can be found in Denmark. Marie has had more than 200 bone breaks. She is little and very frail because her bones break very easily. She attends an ordinary school but has a helper because if she is just hit by a ball it can mean bone breaks. She can also break something if she sneezes. But neverthless, Marie is a happy girl with zest for life. Mads has tumours affecting the nervous system and has often been close to dying. A tumour on Mads' optic nerve means that he is blind. But Mads tries to be like all other 12-year-old boys and so plays Playstation, and likes action films and bicycles. In the February 26th programme viewers also go along when the Crown Princess meets with the children in Amalienborg, where they get to talk and the Crown Princess shows them around. The date of February 29th is the calendar's rarest day which we only experience in leap years. And so the date has therefore become Rare Disorders' red letter day and will be marked with a conference day about diagnosis of rare disorders. The day is to be finished off with a rare disorders march to Copenhagen's city square, where there will be some different events and Crown Princess Mary will hand out a newly founded Rare Disorders Prize. And then, in all future leap years Rare Disorders Day will be marked as an international red letter day. Rare Disease Day "A rare day for very special people"
People living with rare diseases face enormous challenges due to the complexity and the rarity of their diseases. The European Rare Disease Day provides an outstanding opportunity to raise awareness of rare diseases and the special needs of the patients and their families. I hope that by bringing together experience and expertise from across Europe, it will help to improve the lives of those living with rare diseases. 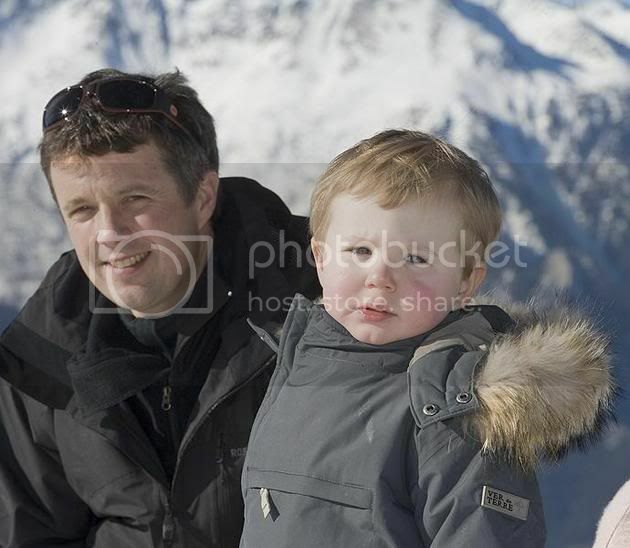 The Crown Prince Family has gone to Verbier in Switzerland for their traditional skiing break (18 February 2008). 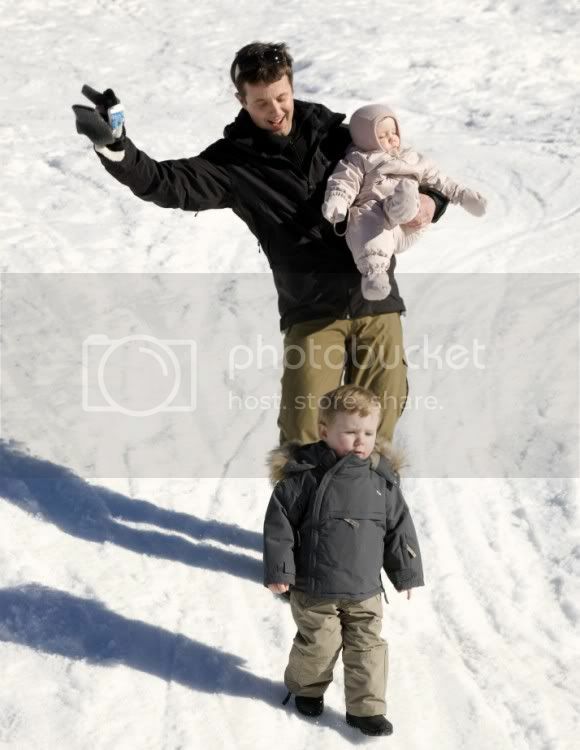 This is the first year Princess Isabella is a part of the family's snowy holiday and Christian seems eager to show little Isabella the ropes, "This is a snowball!" Prince Joachim is acting as regent while the Queen is in Mexico, with Frederik taking over next Monday and then again early in March. 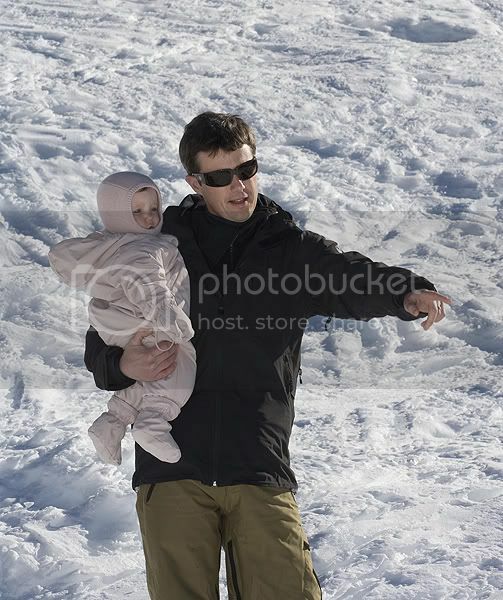 Frederik and Mary have been going to Verbier since 2002 for Mary's birthday on February 5, but for various reasons they are "running late" this year (engagements in Denmark, IOC matters for Frederik - we will post about this shortly). Click here and here to see how Christian has grown since last year. 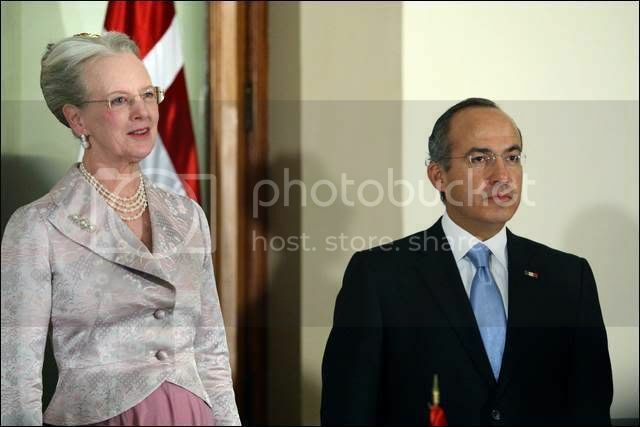 Queen Margrethe and Prince Henrik have been welcomed in Mexico City and have begun their extensive visit to four states and many Danish enterprises operating in México. They can also add the Order of the Aztec Eagle to their many existing foreign orders (the Queen with collar rank and Prince Henrik sash rank). 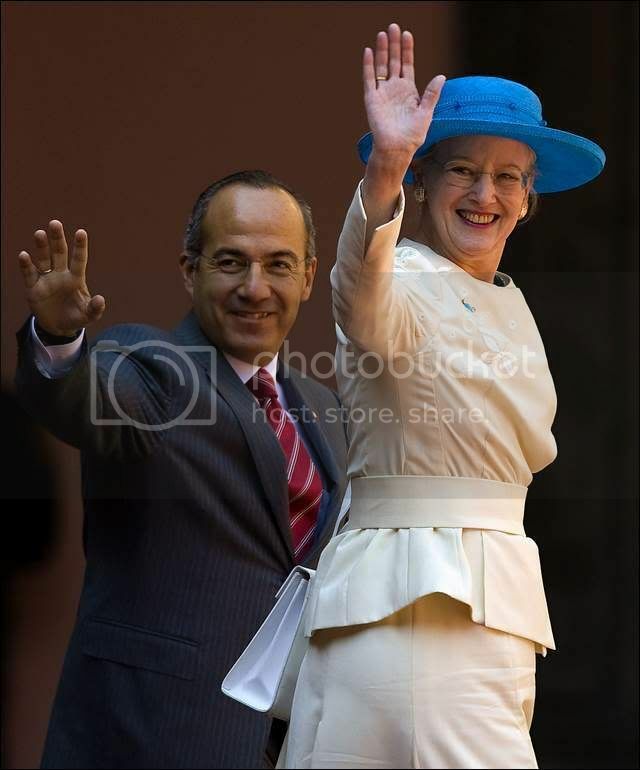 Queen Margrethe and Prince Henrik have encountered the huge mass of people in Mexico City. During the next five days the Regent Couple will travel in every direction around the country. Queen Margrethe and Prince Henrik were thrown into a massed crowd of cars, buses and human beings in their first day in Mexico City. After a short drive from the city's most distinguished hotel they were received in the National Palace, which is located in a central square in the city, zocalo'en . 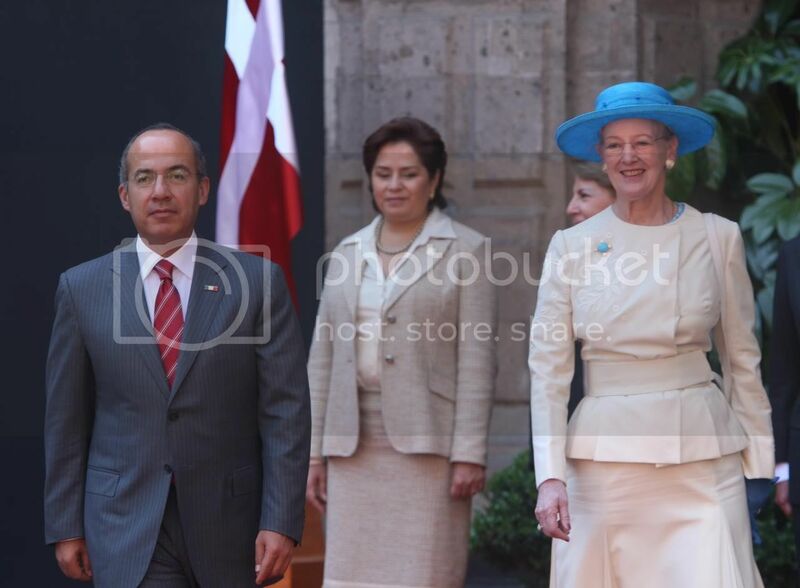 Here President Felipe Calderón waited for the Danish visitors with an honour guard, while they will visits many sights during the next few days in Mexico City and in three states of Mexico. With its 25 million inhabitants Mexico City is one of the world's largest cities. And just as it is on most other days, the pollution hung like a yellow pall over the city, because the high surrounding mountains prevent exhausts from cars and industry escaping. Tomorrow the regent couple will fly north to the state San Luis Potosi and later on in the week [it will be] west to Michoacán. 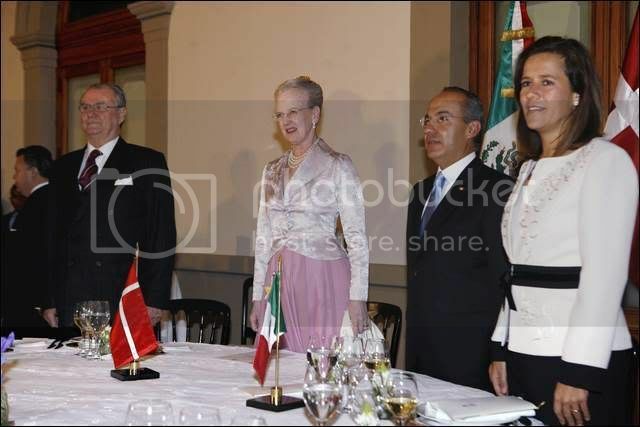 Queen Margrethe and Prince Henrik have attended a State banquet in Mexico. Both the Queen and the President recalled two Danish monks. 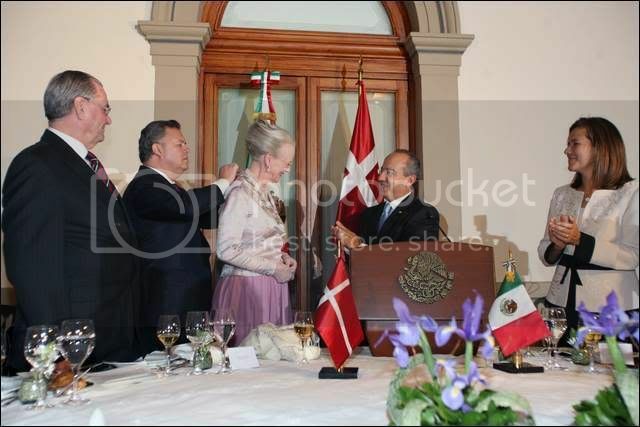 In her speech for president Felipe Calderón queen Margrethe spoke about the Danish monk Broder Jacob* and the adventurer Frans Blom both of whom fought for the rights of the indigenous Indian population in Mexico. The President also spoke about the old Danes, but also about his visit to Denmark last summer, and that it is no wonder, he observed, that the Danes belong among the most happy people in the world. "You have a lot to be happy about: lots of culture and low unemployment. And then, you have a queen," he said. * Broder Joacob was a 16th century Franciscan monk (therefore before the Lutheran Reformation in Denmark) and a member of the Danish Royal Family. Unfortunately most sources about this story are Danish. Same Ritzau agency reports in other Danish online media: B.T., Jyllands Posten, Berlingske Tidende.